Mike & Toni contacted us a couple weeks ago asking about website design. They have another website that they are partially involved in – and originally inquired about having that website overhauled. After talks progressed, they decided to make their own website to start off – and then they will have us re-design the other website. 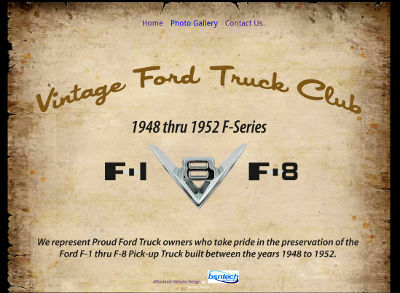 Mike and Toni are vintage Ford truck entusiasts and wanted to start a club that was open to those who have a Ford pickup that was made between 1948 and 1952. Mike sent very specific requirements for the website and wanted it to look identical to his designs. After a couple of design changes, we perfected the look that Mike requested for the website. We appreciate the business from Mike and Toni and look forward to working on their other website as well!